A gym-mad dad was paralysed from the nose down by a rare immune disorder triggered by — a chicken CURRY. David Braham, 40, became unwell while watching his son play rugby after the dodgy meal and within a matter of days was fighting for his life in an induced coma. Medics discovered he was suffering from food poisoning which caused the rare autoimmune disorder Guillian-Barré Syndrome. 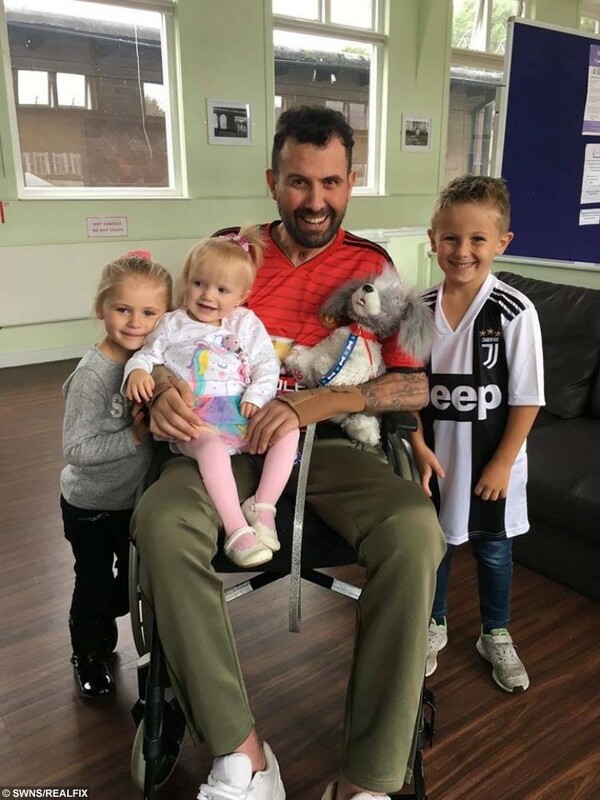 The dad-of-two was left paralysed from the face down, unable to talk, and ended up on a ventilator for four months, unable to breathe on his own. David Braham pictured with his children as he recovered from a curry induced paralysis. 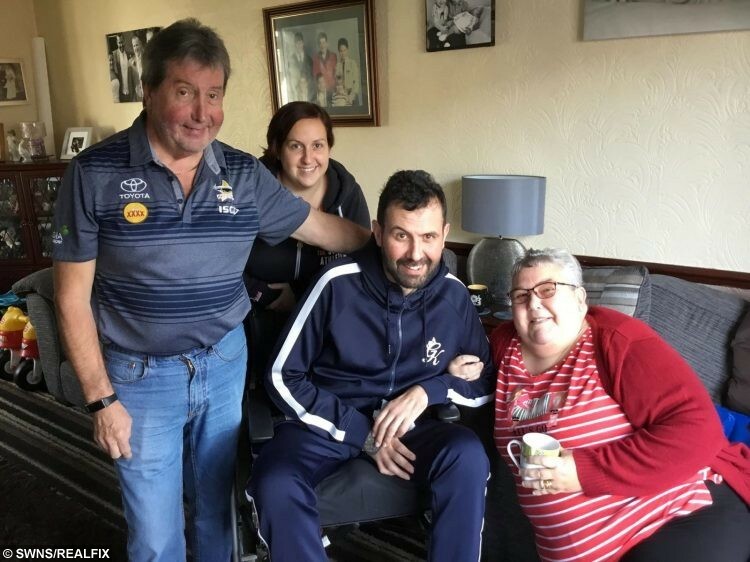 Eight months since the Chinese chicken curry which nearly cost him his life, he can finally walk on his own, and he has been allowed home for a short overnight visit. Former driving instructor David, from Bridgend, Wales, said: “I felt fine until I had the chicken curry. “I just picked it up as a quick meal whilst a pupil was taking their test. “I regret it. I am almost certain that’s what caused it. “I didn’t feel quite right. That night I felt a bit dodgy and I got really ill over the weekend. “I got ill really quickly. It just started with a tingling feeling. “Before I knew it I was literally locked in my own body. It was absolutely terrifying. “”It was like being a living hell. I didn’t know if I’d be able to see my kids again and I didn’t think I’d ever be able to walk again. “It was the thought of my kids that kept me going. I have been fighting for them. I didn’t think I’d survive. 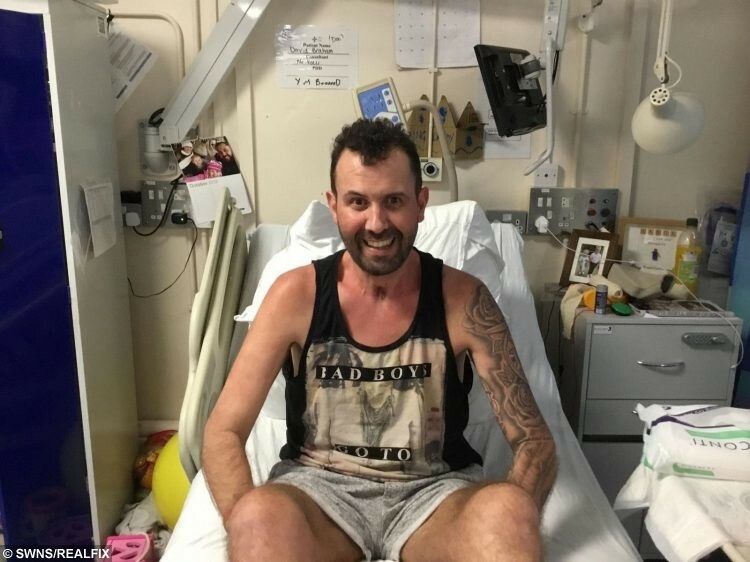 David felt poorly while he watched his seven-year-old son played rugby at Liberty Stadium in Swansea in April, but thought it was a “dodgy stomach” caused by the meal from a roadside cafe. David Braham pictured in hospital with his children as he recovered from a curry induced paralysis. But his condition deteriorated and he was rushed to the Princess Wales Hospital on April 10, four days after tucking into the curry he blames. He was initially treated with antibiotics and sent home after a six day hospital stay. But the next day a tingling feeling started to spread through his body – which eventually caused complete paralysis. Within 24 hours he “couldn’t move a muscle” and was taken back to hospital by ambulance. It was only then that medical staff discovered he had been suffering from food poisoning campylobacter which caused the rare Guillian-Barré Syndrome. The serious and rare condition causes the immune system to attack nerve functions and can be triggered by infections including food poisoning. 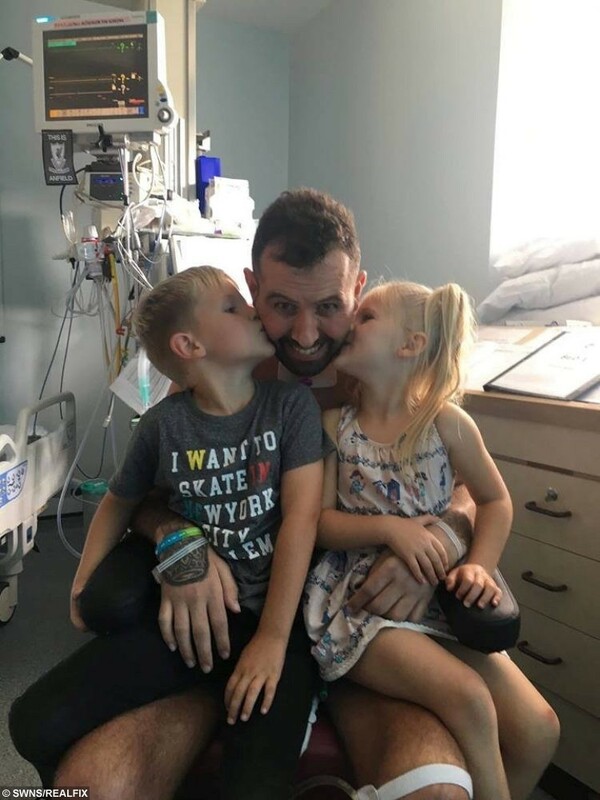 David, who is separated, was placed in an induced coma for four weeks and placed on a ventilator for four months after he lost the ability to breathe on his own. David said: “When I woke up out of the coma I had no idea what was going on. I was paralysed and couldn’t feel a thing. After being woken out of the coma in May, he began on the long and slow road to recovery. In September he was transferred from the Llandough Hospital to Rookwood in Cardiff for rehabilitation. Thanks to daily physiotherapy, occupational therapy, and weekly aquatherapy sessions, he took his first steps in early November. David said: “I had to learn how to wash myself and brush my teeth again. It took me three months to be able to move my legs again. “It was like being a baby and having to learn how to do simple things again. My mind knew how to do everything but my body just wouldn’t respond. “Spending so much time in hospital has been horrible but I’ve got a strong bond with the guys here in rehab. He was able to visit home and spend time with his children for the first time on December 8. He now has his sights set on sitting at the dinner table on Christmas Day surrounded by his loved ones. David, who also has a daughter, Georgia, four, said: “To see my kids open their Christmas presents will be the most special feeling ever. “I can’t wait to be a dad again, just to spent time with the kids. It will feel amazing. His old routine would see him take on five or six gym sessions every week, and the weight-lifting enthusiast is now looking forward to getting back in the gym and work next year. He expects to remain in rehab until at least March.